Summer finally arrived a dew days ago, and the bees have been enjoying the sunshine and warmth. I have been busy beewatching. It struck me that although there are hundreds of birdwatching books available, 'Beewatching' is not a shelf you will find in your trip to the library: number of beewatching books: nil, zilch, zero (sorry, no, I do not mean beekeeping). But why? Although bee watching has challenges, it is immensely rewarding. Plus points: (1) you can do it from the comfort of your garden, in fact gardens are amongst the best habitats to observe bees, as many flowers are available and you can pop out when weather conditions are optimal, therefore, no transportation needed (2) no binoculars or telescopes are necessary, and, (3) with a little investment on garden plants or a home-made bee hotel, you can be rewarded by new species coming to you and behaving as they do in the wild and even breeding in your garden: even small urban gardens can attract a large number of species. Given the lack of field guides on the topic, beewatchers are forced to made themselves out of experience, plenty of patience and readiness to learn. Although many bee species can only be identified under the microscope, some common garden species are relatively easy to identify while they are going about their business. 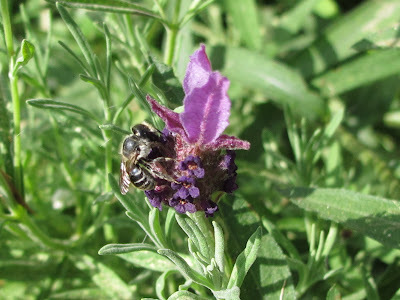 I hope to show here that you can narrow down the group of bee or even identify to species level solitary bee species just by watching the various activities they are engaged with. 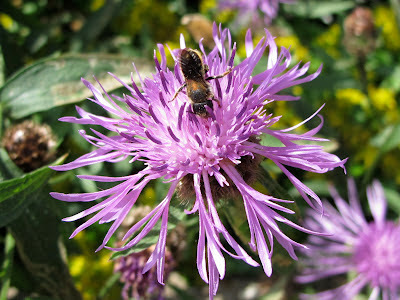 Many bees prefer to visit particular flowers. Some bee species are oligolectic, which means that they gather their pollen from one or a few flower species, others called polylectic, collect pollen from a wide variety of flowers. But even if the bees are polylectic, they often show some degree of preferences, therefore noting which the flowers they are visiting makes it easier to identify bees. This works even for males when they are patrolling and not feeding, as the males will check out the flower species that the females visit for nectar or pollen. A male Anthophora furcata, today, checked first one patch of Stachys sylvatica, then Lamium maculatum, then the other Stachys sylvatica patch. 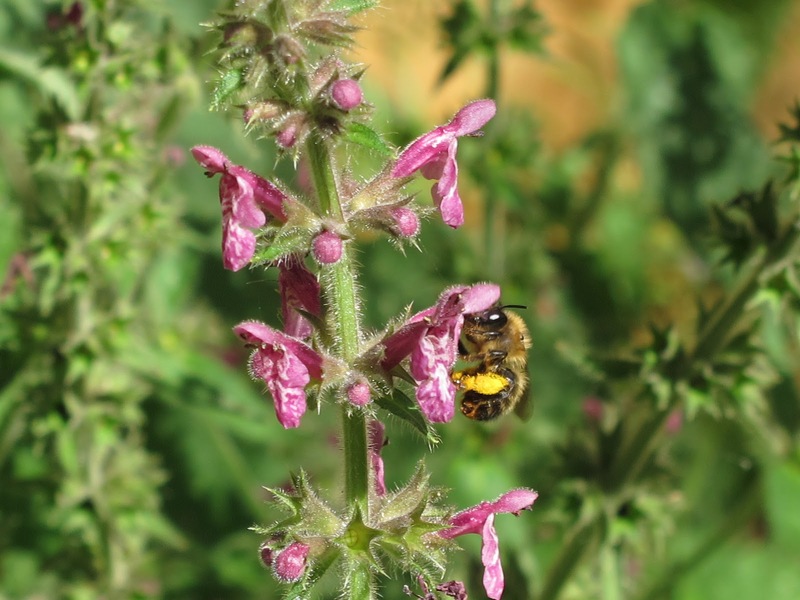 Surely, a female appeared later (below) to collect pollen in S. sylvatica, and the orange pollen she was carrying was probably from Lamium. Wool Carder Bee females are likely to be spotted shaving Lamb's ears (Stachys byzantina) hairs or feeding on the flowers. Megachile willughbiella loves cranesbills, campanulas and everlasting peas. Anthophora plumipes is strongly attracted to Lungwort and Comfrey. It also works the other way round: some plants are visited only by a reduced number of species: only a handful of garden species will visit foxgloves or honeysuckle. A large male bee patrolling campanulas is probably a leafcutter bee, Megachile willughbiella. To make sure, follow him as he flies, as he will settle regularly in a sunny, exposed place after bouts of patrolling (below). Watch him carefully when he stops, he will almost invariably groom his head with his front legs a couple of times after landing - why? maybe wiping his eyes clean? -, and his white 'boxing gloves' will be visible even from a couple of meters away. If you can get closer, crouch down and look at him straight in the eye: he is all concentration, watching for females, rapidly twitching his head looking left, right or up. He does this for a few seconds and then flies off to carry on patrolling. 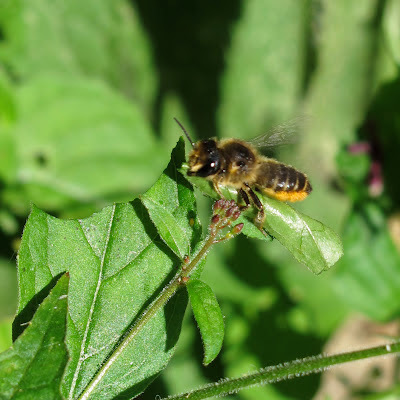 A little bee flying from leaf to leaf, settles and walks sideways along the edge of the leaf briefly, like she is checking it, flies to the next leaf and then starts cutting an oval shape piece with her jaws. Just finishing cutting the piece. Note that the same leaf has two other cut pieces. The edge of most leaves of my Enchanter's Nightshade plants, are all cut out. 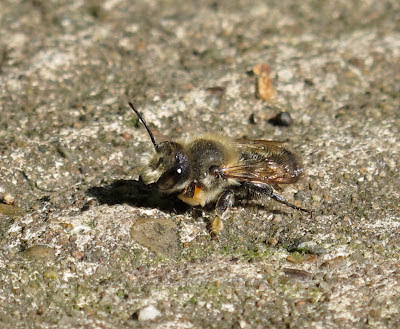 The culprit is the aptly named leaf-cutter bee, Megachile centuncularis. Leaf cutter bee females collect hundreds of leaf fragments to line their nests. As she cuts a fragment, she rolls it under her body using her legs and when she is finished she also holds it with her jaws before she flies up and then straight to her nest. If you can check the underside of her abdomen as she cuts the leaf, you will see the golden brush that characterises this particular species. I watched the first Wool Carder Bees of the year a couple of days ago in the local wildlife garden. Two males patrolling and feeding in a patch of Betony. These are large, powerfully built bees, armed with five sharp prongs at the end of their abdomen. Males are territorial and they will readily attack and expel from their territory any other bees - even big bumblebees -, monopolizing the females that come to feed at their patch. When they rest, they keep their wings open at an angle, with their abdomen exposed. 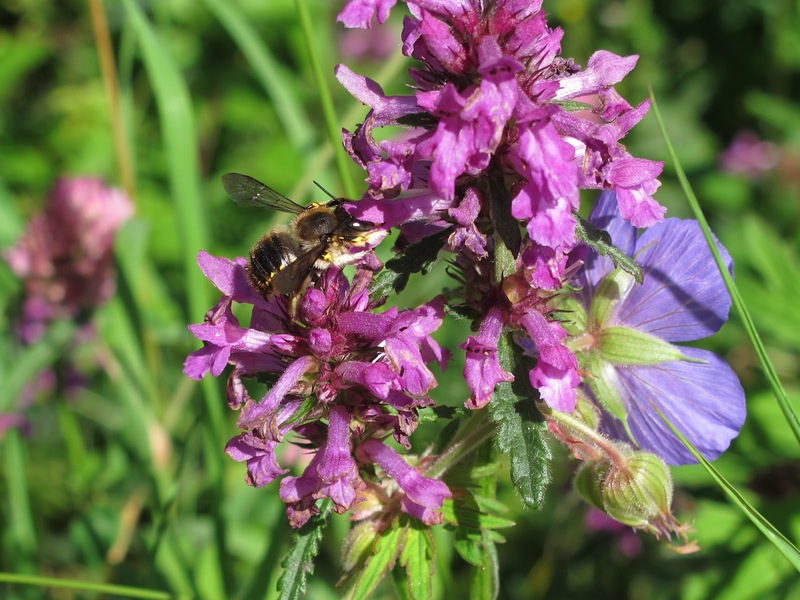 One of the males attacked a Bombus pascuorum feeding on the betony, and the bumblebee swiftly flew away. Watch how the bee feeds on a flower. Leaf cutters (Megachile species) carry their abdomen tilted up, especially females, and rotate on the flower collecting pollen (see top shot). Look under their abdomen, you will see a broad brush of hairs. The color of the brush can help identify the species. 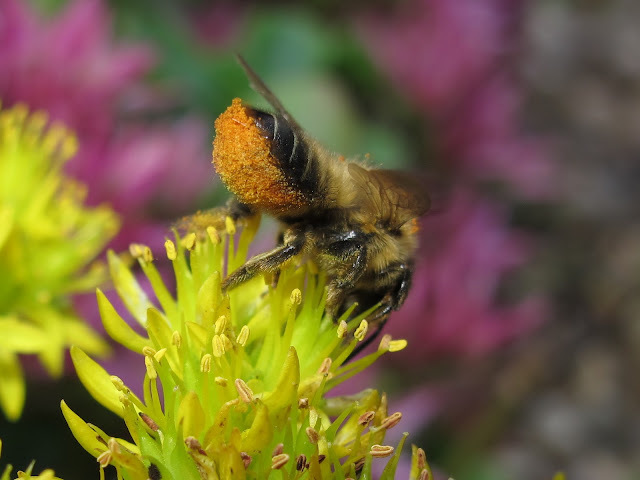 They collect pollen on their rear legs and transfer it to the brush as they move over the flower. Megachille willughbiella females have a red and black brush, while M. centuncularis have an all golden one. Note that the hair color can be obscured by the pollen! This little video I took earlier today shows how she collects pollen on knapweed, a current favourite plant for bees in the garden. Many bee species are small, you might have taken them for small flies in the past, but now that you are watching flowers up close you start to notice them. These two photos show flower preferences in two small Osmia species, which I only found in the garden this year. How could I have missed them before? Solitary Bees fly during relatively narrow periods, maybe two or three months in the species that have a single generation per year, so the time of year is often informative. Anthophora plumipes flies from March to early June, whereas Anthophora furcata has a short flying season in June and July. As you become a beewatcher, you will develop a thirst for learning about the lives of these little critters that share your garden. For some of the species there is little information available, even common species have structures or behaviours that still remain enigmatic (what is the purpose of Megachile willugbiella boxing gloves or Anthophora plumipes hairy legs? why are the scopas of bees different colours, do they provide information to other bees, maybe when mating?). There are some resouces that I treasure, like my Bees of Surrey book by David Baldcock, or the BWARS site, and various bee identification forums, but as these are mainly concerned by identification and recording, I still want a beewatchers field guide. Yes, I have learned so much, too ... and am very grateful to the Cabinet of Curiosities blog for sending me here. Might you consider writing that guide for us all? I have been following Seabrooke's blog for some years, and it has been exciting this year to see her Moth guide published. I couldn't agree more about the rewards of watching the bees. I love watching for them to come back every year, and hoping for more I hadn't seen before. I absolutely adore this post! Bee watching is one of my passions. I just a break from bee watching to type this comment! I'm a bit concerned - It seems that the Giant Resin Bees (Megachile sculpturalis) are intent on opening up & taking over the completed tunnels of the Leafcutter Bees. 2 so far, in my bee block. I'm partial to the lovely Leafcutters...and so, the Resin bee is in the cooler until I decide what I should do. Although, it appears that they are an invasive Sp. in this Country. Thank you Al, it makes sense to me, I cannot even capture specimens for ID purposes, I have a live and let live approach with them. I didn't know about the invasive Resin bees, good luck with your Leafcutters! I simply couldn't watch that Resin Bee undo all of the Leafcutter's hard work. I allowed it to warm-up, and released it in another location (~200 meters away). Thanks again! Yes, agree - great post. I've been trying hard to find that bird book equivalent for bees and other bugs in the Pacific Northwest of the US. Doesn't look like such exists. But, your post points out some ways I could start to assemble it, learning along the way. A fun thing to pursue with my toddler son, who points out bees wherever we go, and is starting to ask more questions about them. "Bee watching", "Pollinator watching". I have been pushing for them for several years. Maybe the time has come. Thank you for commenting Beatriz, I hope the time has come. With more online resources and wonderful books like yours the public is becoming more knowledgeable about bees and pollinators in general. What a wonderful blog - fabulous pictures and such attention to detail! Brava! 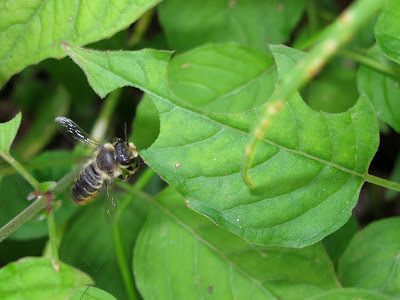 I would like to use the two leafcutter bee photos in this post on my blog. wildbeeproject.com. Blog is non commercial. I live in UT, USA. Also related to this post... my colleagues Joseph Wilson and Olivia Carrill are publishing a bee-watching guide of sorts for North American later this year - "Bees in Your Backyard" Princeton University Press. I'm quite excited about it.